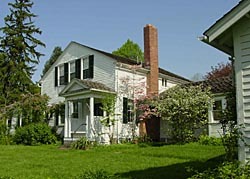 Built in 1821, Spring Hill first served as the home of Thomas and Charity Rotch, a Quaker couple from New England involved in the Underground Railroad. Upon the advice of Dr. Benjamin Rush of Philadelphia, they moved west to Ohio in 1811 to cure Charity's spotted fever with a healthier climate. Before their home was built, the couple lived in a log cabin on their 4,000-acre Spring Hill Farm on which they raised merino sheep. The home that stands today was designed by Jehial Fox. As Quakers and regular attendees of the Ohio Yearly Meetings of Quakers at Mount Pleasant, Thomas and Charity used their home as a safe haven for slaves escaping to freedom in the North. Charity mentioned this practice in her journal and an 1821 letter to her sister in the East. The Rotches' story is the focus of a book by Ethel Conrad, Invaluable Friends: Thomas and Charity Rotch . 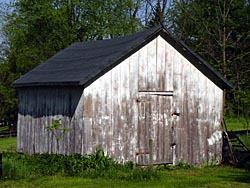 By 1820, before the construction of the house, slaves had been harbored in the upper story of their log springhouse. After their new dwelling was built, the Rotches housed slaves in the basement kitchen area and the second floor. In the new house, a staircase led directly from the basement to the second floor while being hidden from the first floor. This staircase was likely configured to offer domestic servants an unobtrusive byway, but proved useful in hiding the movement of escaped slaves through the house. As a testament to their commitment to protecting their houseguests, no slave was ever caught at Spring Hill despite attempts by slave hunters. The Friends of Freedom Society and the Ohio Underground Railroad Association now recognize Spring Hill as an Underground Railroad site. After Thomas died in 1823 and Charity in 1824, the house was transferred to their heirs. In 1830, Arvine Wales purchased the home and 60 acres, building a west wing on the house in 1831. Wales also supported the abolition movement. The Wales family has owned the home all but a few years since then. In 1910, the house saw more changes and additions, the last being a screened-in porch built in 1920. Today, Spring Hill is the oldest house of significance remaining in Massillon. Spring Hill is located at 1401 Spring Hill Ln., in Massillon, Ohio . The house is open for tours from 1:00pm to 4:00pm Wednesday, Thursday, and Sunday from June-August. For more information call 330-833-6749 or visit www.massillonproud.com/springhill .